Seventy years ago, the then British prime minister Winston Churchill declared May 8, 1945, to be “Victory in Europe Day” after a gruelling five-year war against Nazi Germany and its allies. In making plans to commemorate this historic day, the present Leader of the House of Commons wrote to Church Leaders as follows: “VE day 70 is an opportunity to remember the sacrifice and sheer determination of the people who saw us through this dark period, give thanks to those who so bravely played their part and celebrate peace and reconciliation. The government would like to invite churches to contribute to the weekend’s events with a ringing of bells, where they are able and in a manner of their choosing”. 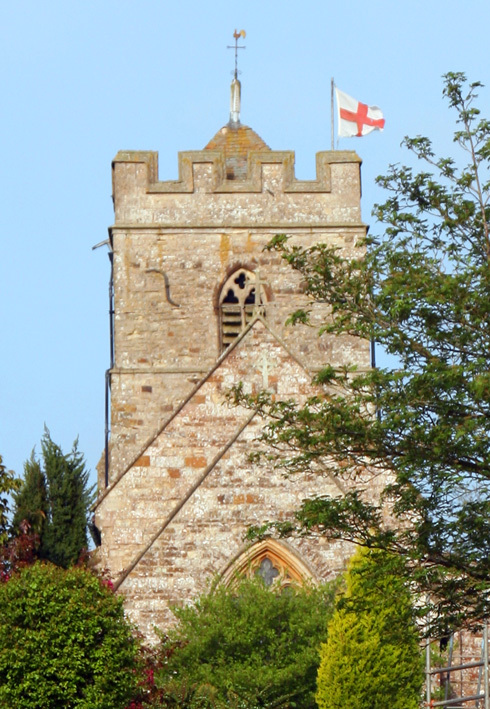 As “Tower Captain”, Hywel Lloyd was asked to organise such a ringing at Sulgrave Church on Sunday 9th May. See the next page for photographs of this event, with an opportunity to hear the bells and read some memories of Sulgrave in 1945 and of those from the village who served during the five years of conflict leading up to VE Day. 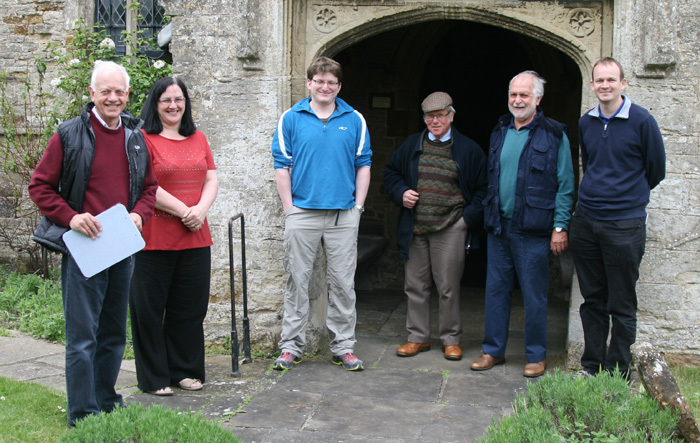 The bell ringing team (left to right): Hywel Lloyd, Judith Johnson, Christopher Jackson, Martin Rowling, Julian Partis and Richard Carey. Click on the picture to hear the bells. So, what was the village like for a 7 year old boy in May1945? 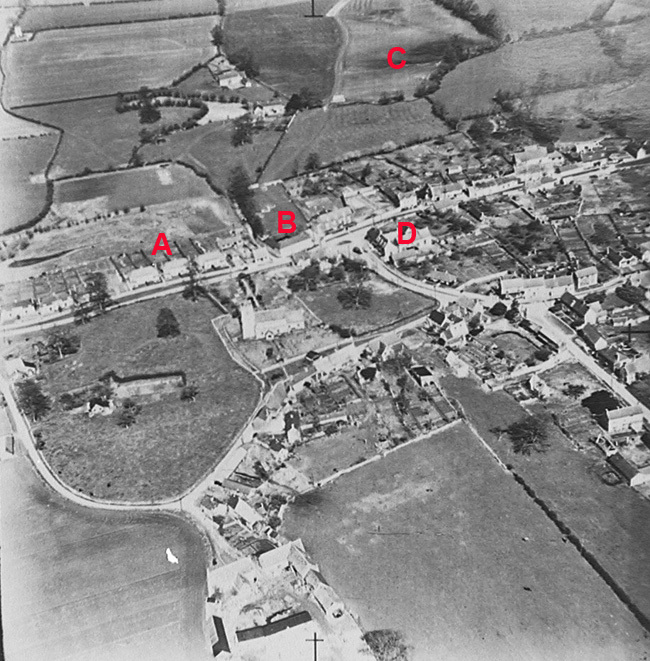 From this aerial photo taken around that time four cars can be seen in the Manor car park…..
……and none at all in the rest of the village, other than what is probably a delivery van outside the then shop. It was, of course, very different for those villagers in the armed forces. After a forced landing in Germany during a bombing raid in 1940 my cousin Bill Wootton, an RAF pilot, spent the next five years as a prisoner-of-war. In the days leading up to VE day he and his fellow prisoners endured forced marches as part of the many columns of German soldiers, prisoners and refugees fleeing before the advancing British, American and Russian forces, sleeping where they could at night, eating what they could scavenge and not infrequently harassed by the SS or even by “friendly fire” from allied aircraft. 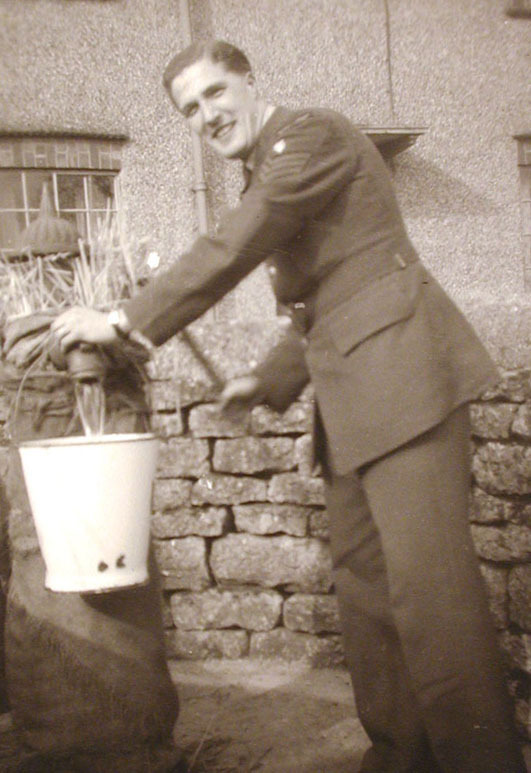 His normal body weight of 12.5 stones had been halved by the time he arrived back in England three days after VE day. 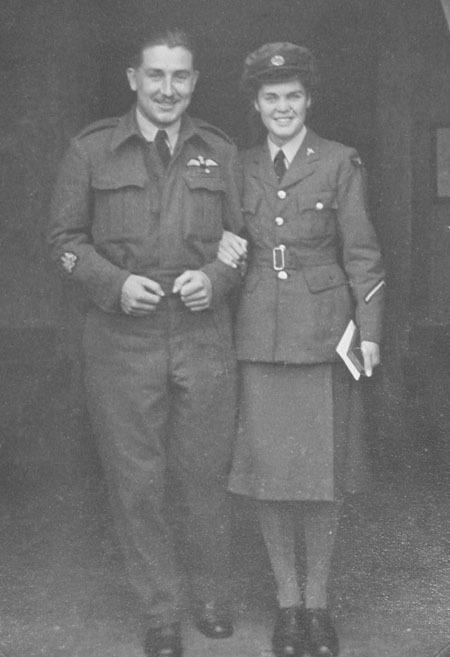 He was almost immediately in hospital, very ill with pneumonia, during which he was cared for by a WAAF nursing orderly Leading Aircraftswoman Margaret Swenson. 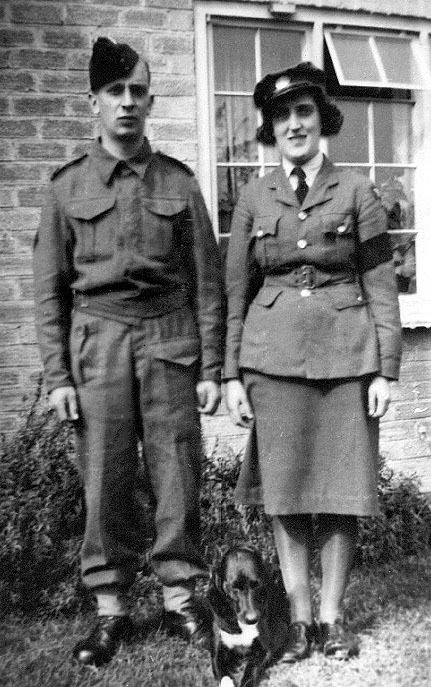 Their friendship blossomed and they were married within six weeks of him leaving hospital, on 15th September 1945, in Sulgrave Church. Read more about Bill Wootton’s wartime experiences. My uncle Len Branson was in Germany on VE day. 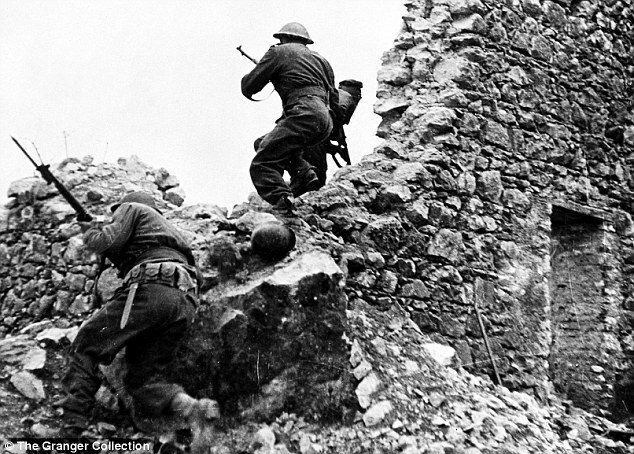 He was an infantryman who unlike several of his less fortunate pals had survived the January 1944 landings at Anzio in Italy, the battle for Monte Cassino and the final assault on Germany itself. My aunt Doris Branson was in the Women’s Auxiliary Air Force, for ever known as the Waafs. Initially she was stationed at nearby Finmere and I have vivid childhood memories of seeing her in her smart blue uniform, walking off to Helmdon station to catch the train. She became a Leading Aircraftswoman and subsequently served at Poole in Dorset and Darlington in Yorkshire. The airfields where she served could come under attack at any time. Danger was ever present and on one occasion her station commander was killed in an attempt to rescue the crew of a crashed bomber. From such fraught situations came friendships which endured for the rest of her life. 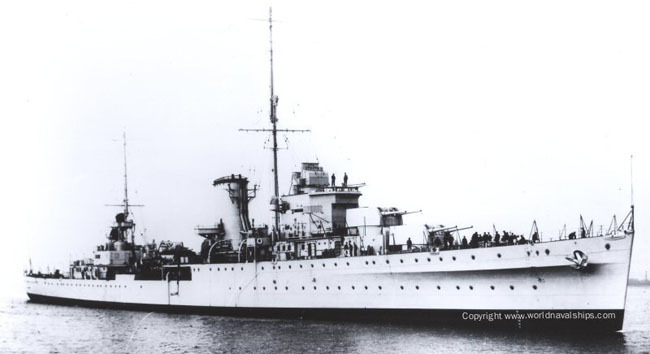 My relative Harold Wootton joined the navy and served on HMS Ajax, a light cruiser which had taken part in the Battle of the River Plate in 1939. He joined her after the battle and for much of the war was in the Mediterranean escorting the vital and heavily attacked convoys to Malta. My uncle Reginald Butcher was a driver with the Royal Army Service Corps, serving in France after the Normandy landings. 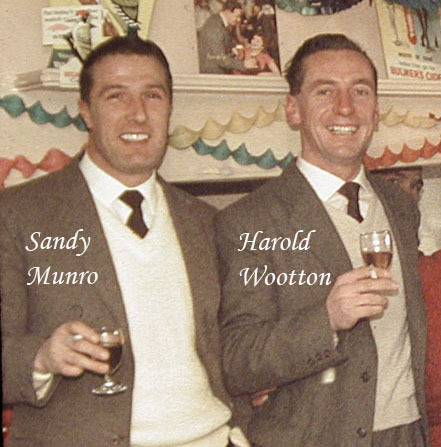 Left to right: Reg Butcher, Harold Wootton, Sandy Munro. 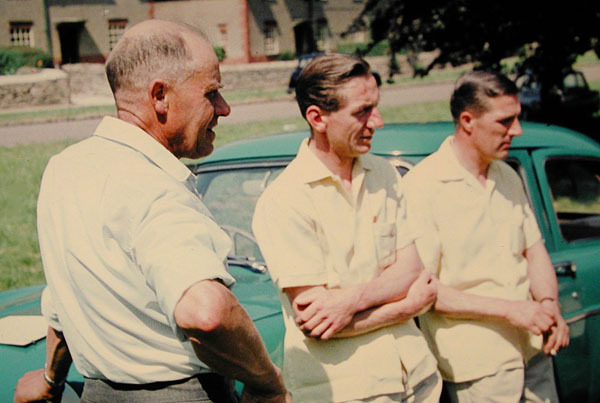 On village green at start of a car rally in the early 1960s. John Young served in the army in right at the end of the war. He was an accomplished football goalkeeper who had played very successfully during his service career. He kept goal for the Sulgrave team in the fifties and helped to manage the team in the early sixties. His wife Lily still lives in the village. 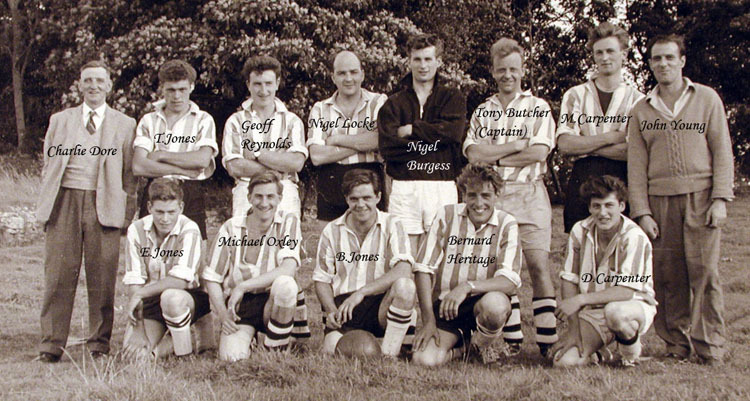 The village football team in 1962, with John Young standing on the far right. Bill Cleaver also served in the army, married in Germany and brought his bride home in 1946. They lived in the village for the rest of their lives and their daughter Gudrun attended the village school. 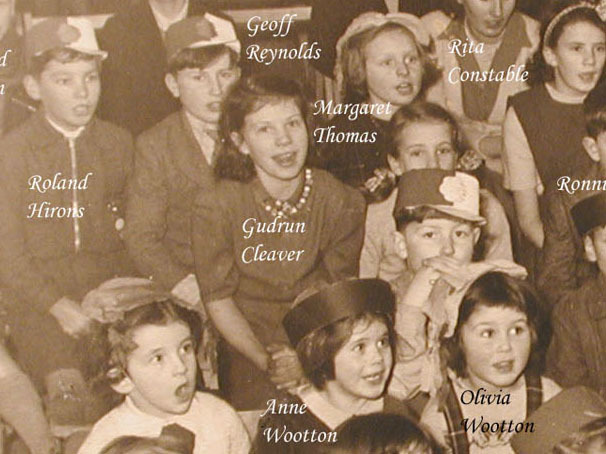 Gudrun can be seen in this 1953 photo taken during a Christmas Party in the school. The children are watching a conjuror! My own father Sidney Wootton led something of a charmed life during those dramatic times. As a builder he was drafted into airfield construction at the start of the war. 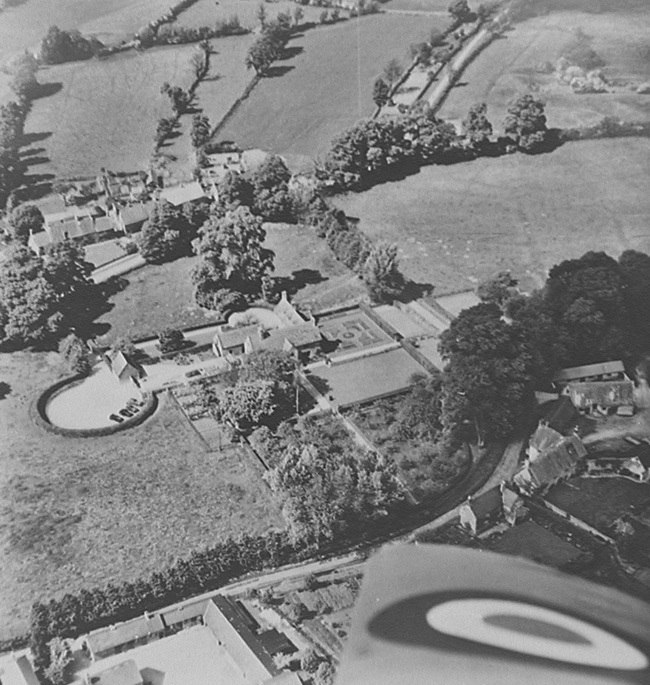 He was working with his elder brother Bill at nearby Chipping Warden airfield in when he was ordered to report for a medical examination as a prelude to joining the armed forces. On the very day he attended the examination a Wellington bomber crashed at the airfield and his brother was killed. Thus, in a curious turn of fate, joining the army saved his life. He trained as an infantryman but was ill in hospital when his unit sailed for active service. 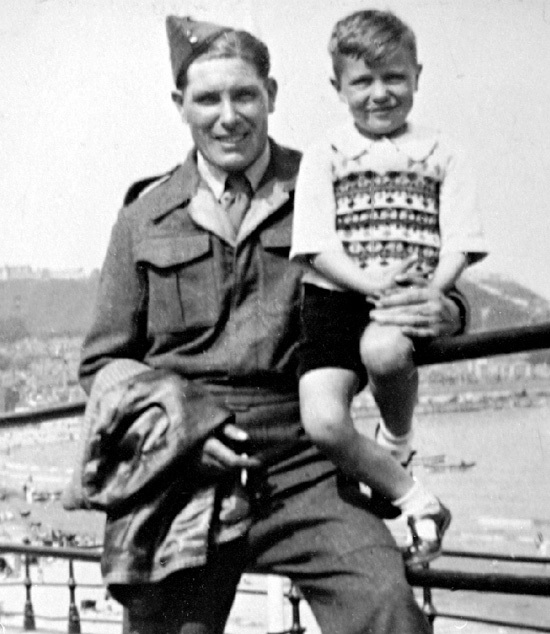 I saw little of him during the war but a little after VE Day we were reunited as a family in Scarborough, near where his unit was based. However, for some villagers VE day did not mean “cease-fire”. Bill Archer was still fighting against the Japanese with the “forgotten 14th” army somewhere in the jungles of Burma. Japan surrendered in August 1945 after the dropping of atomic bombs on Hiroshima and Nagasaki. Bill and my father were good friends and both had been unemployed for some time in 1934. They decided to join the army but my father was offered a job in Northampton and so Bill enlisted alone. As a regular infantryman he survived the disastrous 1940 campaign in France, was evacuated from Dunkirk and later transferred to the far east. He simply couldn’t settle after his return to the village and in 1948 he emigrated to Australia with his family. By using the “Assisted Passage Migration Scheme” the five week sea voyage cost him and his wife a mere £10 each and the children went for free! His sons David and Tony were my best friends and in those days when they said goodbye we knew we would never see them again. Sadly, Bill was killed in a traffic accident in Brisbane in the fifties, David joined the Australian navy and was killed during an exercise and Tony also died young in a traffic accident. Such is fate. Unlike the 18 young men and women of Sulgrave who lost their lives in the Great War, “only” one serviceman failed to return to the village in 1945. His name was Hector Webb and he met a truly horrific fate at the hands of the Japanese. He was a Leading Aircraftsman in the RAF and was one of the many who fell into Japanese hands when Singapore was over-run in 1942. He was on board a Japanese ship sailing northwards into the Java Sea when it was torpedoed by a US submarine. What happened next is set out in the official account: “The ship started to list as water poured into the holds drowning hundreds, many managed to escape the holds and swam away from the sinking ship. The Japanese mine sweeper W-12 picked up the Japanese survivors, leaving between 200 and 250 men in the sea. At 14.50, the minesweeper, W-12, under orders from Captain Kawano, opened fire, using a machine gun and rifles. Rafts and lifeboats were then rammed and sunk by the W-12. The firing did not cease till all the prisoners were killed, the minesweeper then picked up speed and sped off towards Batavia (Jakarta) at 16.30 hours.” Read more. These men and women were indeed part of a remarkable generation, called upon to endure the complete disruption of their normal lives and in many cases suffer unimaginable hardships. Sadly I have no photographs of Hector Webb but I think we should keep a special place in our hearts for a young man who met such a lonely and savage death far from his native village. I have restricted these wartime memories to those who were actually living in Sulgrave at the time when they were called to serve. There were, of course, many others who came to live here at various times after the war who had also served with distinction, but that’s another story…. 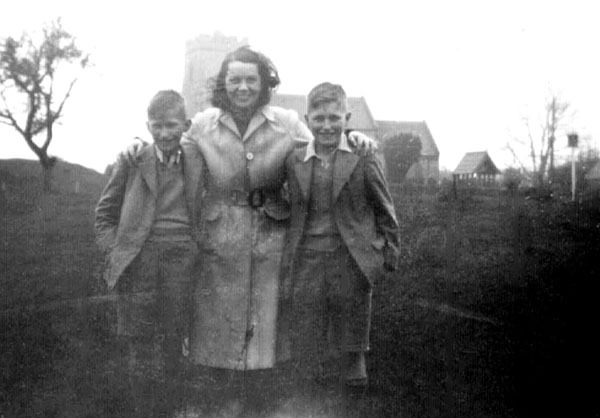 My memories of events from 70 years ago are necessarily focussed on members of my own family. I am sorry if I have missed anyone who deserved a mention and will be very happy to add further information as and when it becomes available. See here for more wartime memories of Sulgrave. This entry was posted on Wednesday, May 13th, 2015 at 9:30 am	and is filed under News. You can follow any responses to this entry through the RSS 2.0 feed. You can leave a response, or trackback from your own site. Hi Colin 🙂 I faithfully follow the Sulgrave village website and suffer waves of nostalgia every time I look at it. My family lived in Stone Court (next to Dennis and Joan Gascoigne) from about 1961 to 1966 when we emigrated to California. In response to your most recent posting about the VE 70 celebration, I would like to share that my Dad, Sidney Roullier served in the RAF as a pilot and flew decoy missions over Germany, dropping bits of foil to confuse the German radar in advance of the real bombers — a dangerous job! My Dad loved flying and was so honoured to serve his country, but hated the destruction of war. He spent much time in Germany on business after the war. I think he always felt sadness for the part he played in the suffering of many innocent citizens there. He passed away last August at the age of 91, a proud Englishman to the end.